the developer. Unit prices vary between R1,525,435.00 and R1,579,115.00, depending on the layout. per year per shareholder (52 weeks per year). Fractional Title units are available at a cost of R160,000 for 2 weeks and work on a rotation basis. The estate has an electric fence around a the perimeter with 24 hour security guards on site. Acces control is through a manned gatehouse. The estate also has a communal swimming pool. Click on the "for sale" tab for pricing info. 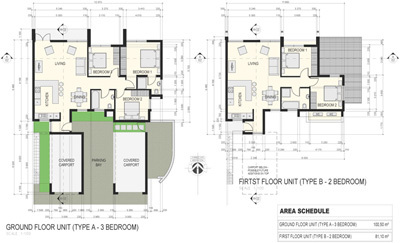 Alternatively, click on the images to the right for pictures and floorplans. Paperbark is modern trendy residenial estate conveniently located on the corner of Witkoppen Road and Malibongwe Drive (Hans Strydom Drive) in Northriding. It has easy access to Fourways, Randburg, Douglasdale, Midrand, Lanseria Airport, Pretoria and Sandton. The development consists of 252 sectional title units comprising of studio apartments, funky duplex lofts and 1 and 2 bedroom units. Residents will enjoy the benefit of basement parking with ample vistors parking available. Paperbark Estate features a secure perimeter wall with access controlled gatehouse and 24 hour security. Residents can also relax in the entertainment facility which includes a club house and lanscaped pool area. Saint Olympus is an exciting residential development in an upmarket area in Pretoria East. The development consists of full title units and there are 5 designs buyers can choose from. Full title Vacant stands are also available and there is no time limit on developing or building on the stand. Investors also have the opportunity to make use of their own contractors. Wilgepark is a new property development in Potchefstroom. It's convenient and central location makes this ideal for students and young professionals, and is a great investment opportunity. Wilgepark features bachelor apartments and 1 bedroom apartment. All units come with well appointed kitchens with quality, modern finishes. Occupation is set for end September 2011. All prices include VAT, transfer fees and attorney fees. Wilgepark 2 is a an additional section to Wilgepark. This section is aimed at people who wants a bigger and more independant living space and is ideal for young couples or first time buyers. Wilgepark 2 consists of free standing 2 Bedroom townhouses with lock-up garages and the same high standard modern finishes. Occupation is expected to be at the end of 2011. 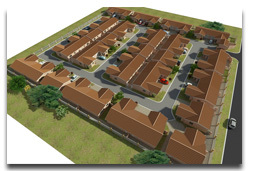 2 Bedroom townhouses from R623,000.00 including VAT, transfer fees and attorney fees.